Loostripper started the career as a solo artist, doing all the vocal, guitar, bass, drums, electric piano and track-making. 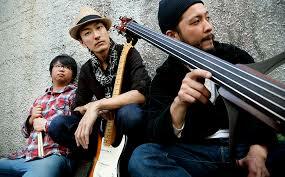 Now the project turned into a 3-piece band with Yoshito Hagiwara, Takayuki Yamamoto and Shintaro Imamura. Each member comes from a different musical back ground such as rock, jazz, hip hop, and blues. And the diversity of their difference has been creating the unique sound of the band ranging from jazz swing or smooth acoustic guitar to heavy guitar sound.